It’s kind of a no brainer that we need to drink water, right? After all, our bodies depend on it to function properly. But what if your water is not as clean as you think? That just might be the case if you are drinking unfiltered tap water. In fact, a 2017 analysis of water samples from all across the United States revealed over 267 different types of toxins in our tap water! Turns out that tall drink of water may actually be a tall drink of toxins!! Recently, I read an article on the front page of the local paper stating that a half dozen wells in the town of Marana have been polluted with toxic chemicals. Marana is a small town not far from where I live so I was a little freaked out when I read this. What was even more disturbing is the Marana Water Department has known since 2016 that the wells were contaminated! You never want to think that this is happening in your own backyard, but the reality is water contamination is becoming pervasive and we need to be aware so that we can protect ourselves. How are these chemicals getting into our water in the first place? The short answer is our water supply has become increasingly toxic due to an infrastructure of aging pipes and chemical pollution from wastewater treatment plants. The water treatment facilities simply cannot effectively filter out the abundance of toxins showing up in our water supply. Some of the chemicals that are typically found include lead, chlorine, fluoride, and arsenic. 1,4-dioxane which is a synthetic compound and polyfluoroalkyl (PFAS) which is a man made compound were found in the Marana wells. All of these chemicals can cause a wide range of health problems. Dioxane and PFAS, which I talked about in my article on toxic cookware, are known carcinogens. Last year, I finally decided to go all out and had a whole house filtration system installed. I used a local company called WaterTec. This system uses carbon filters and the unit is about the size of a water softener. It is located in my garage and takes up very little space. I thought it would be more expensive but it definitely did not break the bank. I think it was a little over $1000. When deciding on what you want to do, it might be helpful to know what toxins are in your water. The EPA regulates tap water in the U.S. and you can obtain a local drinking quality report from them. You can also check out the Tap Water Database from the Environmental Working Group (http://www.ewg.org/tap-water.com). When you enter in your zip code, you can see the latest information on the contaminants in your water. I also called my local water company and they sent me the latest testing report. Once you know what contaminants are in your water you will know what type of filter will work the best. Always look for a filter that has been NSF certified. The National Sanitation Foundation is an independent testing laboratory that certifies water filters. Reverse Osmosis – RO can remove chlorine, inorganic and organic compounds and about 80% of the fluoride. Carbon Filters – carbon filters can remove asbestos, chlorine, lead, mercury and other organic compounds. They do not remove fluoride or arsenic. Ion Exchange – this is designed to remove heavy metals and minerals such as calcium from your water. It does not remove chlorine. Obviously, everyone has an opinion on what type of filter works best. It can get confusing for sure. Read reviews, ask friends what they have, consider your budget and then just go for it! Whatever you decide will be the right choice for you. And, if you have to grab a bottle of water while you are out and about, there is some good news. I have seen 3 companies (pictured below) who are selling spring water in glass bottles! Woohoo!! I was at a conference a couple years ago and Castle Rock Water was there. The company had just started selling their bottled water and I was pretty impressed with the source and the quality. As always, I would love to hear from you. 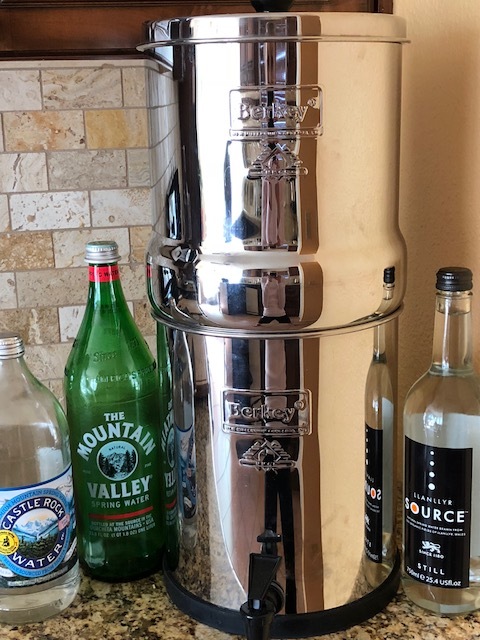 Do you have a favorite water filter? Hit reply and let’s chat!